Prepare and bake 1 pkg. (2-layer size) cake mix (any flavour) as directed on package for 24 cupcakes. Cool completely. Beat 2 Tbsp. butter and 1/2 cup (1/2 of a 250-g container) Philadelphia Cream Cheese Product in medium bowl with electric mixer on medium speed until creamy. Gradually add 2 cups icing sugar, beating until well blended after each addition. Spread evenly onto tops of cupcakes. 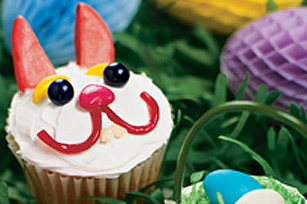 Decorate each to resemble a bunny using red licorice and assorted candies. Store in refrigerator. Pour the cake batter into a large resealable plastic bag. Snip off 1 corner from bottom of bag and squeeze the batter into paper-lined muffin cups. It's much quicker and less messy than spooning the batter into each cup.